The Twitter-based leaker IceUniverse has released a new post that purports to outline the screen sizes of the upcoming Samsung flagships. It applies not only to the impending Galaxy S10 line, but to the Galaxy Note 10 as well. This phablet will apparently come with an impressive 6.75-inch display. 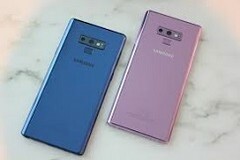 Those who are already worried about what the Galaxy Note 10 is going to do to their wallet may also want to start thinking about how it's going to fit in their pocket. The upcoming Samsung classic phablet is now rumored to have a larger screen than ever before. This leak comes via IceUniverse, a typically reliable tipster in these matters. It claims to outline some of the screen dimensions of the Samsung Galaxy S10 line - and also that of the Note 10. It states that the screen diagonal lengths of the S10 Lite, base S10, S10 Plus and 5G-enabled S10 will be 5.75, 6.11, 6.44 and 6.66 inches respectively. It goes on to put the Note 10's screen at 6.75 inches in total. On one hand, this panel would hardly be the longest around (for example, that of the Huawei Mate 20 X measures 6.99 inches, after all). On the other, with Samsung's reputation for screen quality and clarity, it could well be one of the best mobile-device displays of 2019. In addition, with the possibility of next-generation sensor inclusion techniques such as Infinity-O, the entire front panel of the hypothetical Note 9 could be designed to maximize screen-to-body ratio while conserving its actual footprint. However, we will have a long wait into next year to find out for sure.